The CGE Pro 1100 Schmidt-Cassegrain Telescope is part of Celestron's "Top-of-the-Line" German Equatorial mounted astronomical telescopes. 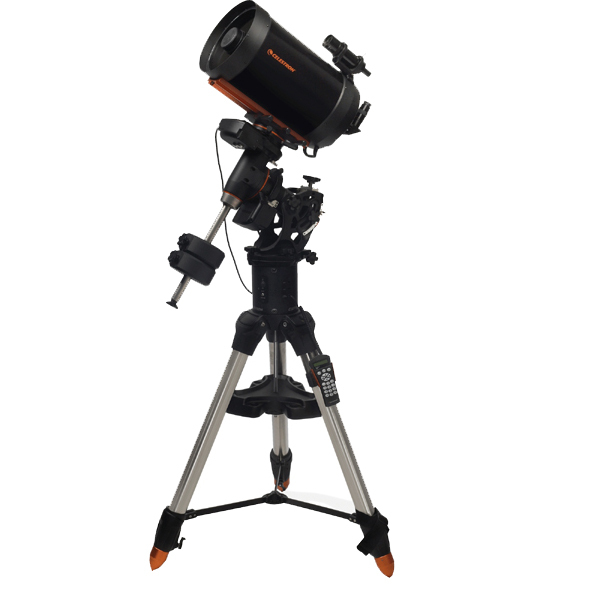 With the optical tube assembly of the CGE Pro 1100 weighing only 27.5 lb., this telescope is still portable enough to be taken to dark skies, and it has 89% more light gathering power than an 8" telescope and more than 40% more than the 9.25". Balance - CGE Pro Equatorial mounts can easily be balanced in both axes. Simply sliding the counterweight for Right Ascension and moving the optical tube along its dovetail mounting for Declination, accomplish balancing the weight of camera equipment and other visual accessories. This means that no additional weight needs to be added to balance the telescope when additional accessories are added. Clearance - CGE Pro mounts support their tubes at a single contact point allowing the tube to move freely around its polar axis without making contact with the telescope's mount. Software features allow the user to set the mounts slew limits to guaranty safe motion. This is particularly useful when adding photographic and CCD instruments that extend from the rear of the telescopes. Clearance - CGE Pro mounts support their tubes at a single contact point allowing the tube to move freely around its polar axis without making contact with the telescope's mount. Software features allow the user to set the mount's slew limits to guaranty safe motion. This is particularly useful when adding photographic and CCD instruments that extend from the rear of the telescopes.